DSC05537, a photo by milliemooshu2012 on Flickr. As part of my Christmas hamper I wanted to print some tea towels. I had a lovely screen printing kit for my birthday and thought it was time to have a good go. 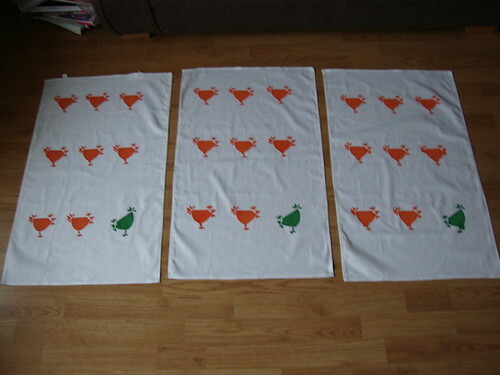 I found a lovely chicken stencil and set to printing these cute tea towels. I purchased the plain tea towels online at a good price so I didnt have to worry about cutting out lengths and sewiing. I had great fun printing. The screen printing set came from Speedball on Amazon. I can highly recommend it as a starting point for home printing.